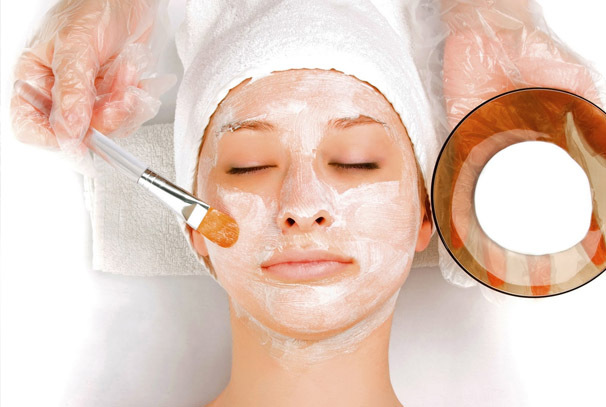 A facial is a cosmetic treatment of the face, commonly involving a variety of skin treatments. This includes steam to open the pores, exfoliation, extraction, creams, lotions, masks, peels, and massage. Normally performed in a beauty salon, it is also a common spa treatment. This opulent anti-aging treatment lavishes your skin with pure Caviar Extract and a revolutionary blend of phyto-extracts called Escutox(R). Designed to stimulate the nerve endings, Escutox(R) will repair the skin, relax wrinkles and increase hydration resulting in visibly youthful skin. Brightening and renewing, this treatment features a potent blend of Vitamin C combined with the formulation of freeze-dried seaweed. It reduces your fine lines, strengthens elasticity, and provides relief for dull, sun-damaged skin leaving you with a luminous glow. Uses natural enzymes Lipase and Amylase through advanced Freeze-Dried technology and incorporates seaweed and sugars. Effectively removes deep clogging, blackheads, and dead cells to prepare skin for further treatment. A dynamic non-surgical face-lift combines 6 potent peptides and topical wrinkle filler Hyaluronic Acid to reduce wrinkles, crow’s feet and expression lines. Argireline is the natural Botox alternative ingredient proven to relax the muscles that cause fine lines and wrinkles. Galvanic technology produces instant results that will take years off your appearance, and give your skin a youthful lift. Embrace and enjoy this relaxing and effective treatment for your often neglected back. Deep pore cleansing with steam preparation, extractions, and a rejuvenating mask. This treatment will leave your back feeling clean, smooth, and silky to the touch. Upgrade your facial treatment with a special collagen mask or serum. Our masks help hydrate dry skin, some give your skin deep exfoliation, while others help to heal, soothe & nurture problem skin. Your aesthetician will recommend which specialty mask is best for your skin. Anti-aging or anti-hyperpigmentation serums can be applied after an ionthophoresis treatment. Much less aggressive than the traditional TCA formulations, these peels are ideal for dehydrated and aging skin in need of rejuvenation. Perfect for Anti-Aging, Hyperpigmentation and Rosacea. Those with resilient skin who have more dramatic wrinkling, sun damage and acne scaring are the most suitable candidates for this deeper and more active treatment. It will effectively treat againing skin, acne, pigment disorders, smoker’s skin and photodamage. Ideal for aging skin in need of rejuvenation. Ideal for acneic and problematic skin. Will help reduce breakouts, control oil, improve texture and soften line. Combination of 20% salicylic acid, cherry extract and other natural ingredients, this peel will improve acne and brighten sluggish and dull complexions. It is exfoliating, anti-bacterial and anti-inflammatory. Helps fight free radical damage, stimulates skin respiration and circulation. Rejuvenates skin, promotes healing and draws oxygen to the surface of the skin. Great for use between peels or when flaking is not desired. Recommended for pregnant or lactating women. A detoxifying treatment for all skin types. The active blend of lactic, glycolic, and salicylic acids penetrate pores deeply and dissolves impactions and blackheads, kills bacteria and reduces inflammation. Great for pregnant and lactating women. This two step process is formulated with potent yet skin-friendly ingredients that will even discoloration while smoothing and brightening the skin. The combination of TCA, Lactic, and Salicylic acid affects dramatic changes in the skin’s appearance and texture. An excellent choice for treating rough, dehydrated, sun-damaged or acneic skin on the arms, legs, back, chest, hands and feet. Microdermabrasion (Microderm) is a cosmetic procedure in which the stratum corneum (dead outermost surface of the skin) is partiailly or completely removed by light abrasion. Microdermabrasion can be used medically for scar removal when the scar is raised above the surrounding skin, but is less effective with sunken scars. Microdermabrasion can also be used for treatment of acne, but must be repeated periodically to be effective. Microdermabrasion should not be used on patients who have taken the medication Accutane (Isotretinion) in the previous twelve months. May we suggest adding a Mini Facial to compliment your microdermabrasion treatment. Waxing is a method of temporary hair removal which removes the hair from the root. New hairs will not grow back in the previously waxed area for three to eight weeks. Almost any area of the body can be waxed, including eyebrows, face, legs, arms, back, abdomen and feet. There are many types of waxing suitable for removing unwanted hair.